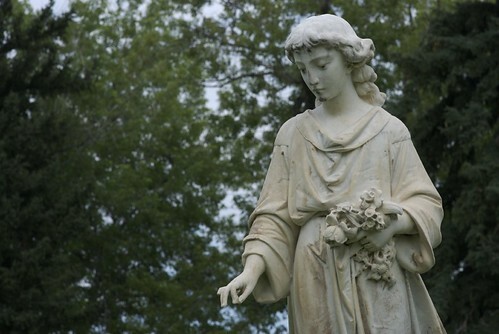 I sometimes see statues in cemeteries, where a female figure or angel is holding flowers in one hand, while the other hand seems to be dropping the flowers over the graves. I’m not sure of the exact significance of this, but the angels appear to be spreading blessings. Perhaps this tradition is related to flower girls at weddings who spread flowers or petals ahead of the bride, or hand them out to the guests. If anyone knows more about this tradition feel free to leave a comment. Photo: Mt. Olivet Cemetery, Wheat Ridge, Colorado (you can click on the photograph for a larger view).